﻿ Expanded graphite packing (with corrosion inhibitor) - China Expanded graphite packing (with corrosion inhibitor) Supplier,Factory - Cixi Aiflon Sealing Materials Co.,Ltd. Braided from low-sulphur expanded graphite yarns, which are reinforced by cotton fiber. It has a very low friction, does not damage shafts or stems. It shows good thermal and chemical resistance and high elasticity. Other reinforcement materials are also available. 2000 & 2000K is a multi-service packing capable of a wide variety of uses throughout a plant. It can be used in valves, pumps, expansion joints, mixers and agitators in high-pressure, high-temperature hostile environments of hydrocarbon processing, pulp and paper, power stations, refineries and industries where effective sealing is vital. 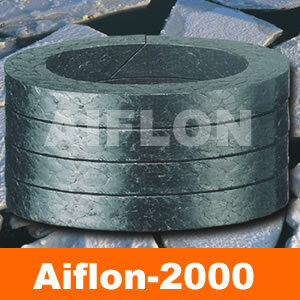 Recommendation: Use preferably with Aiflon 2102 high carbon fiber anti-extrusion packing rings.